US, 1994 1944, 95 minutes, black-and-white. Bud Abbott, Lou Costello, Frances Rafferty. This is one strictly for fans of Abbott and Costello only. Abbott is the straight man, this time an instructor at a barber’s shop to Hollywood and the stars. Costello is doing a course, has been years at it, still failing, especially trying to shave a balloon which bursts when he wields the razor and when he tries with heated knife. This leads to all kinds of hijinks, especially with Costello wanting a date with one of the attendants, becoming friends with one of the actresses, falling foul of a jealous singer, trying to promote a new young singer interested in a career and in love with the actress. It involves going to the studio, being mistaken for a dummy, all kinds of pratfalls, and eventually his being needed as a substitute and stand-in for the film. In the meantime, the ageing singer, jealous of the singer, tries all kinds of plots to ruin his career, but he is thought to be killed, so Costello disguises himself, meets the disguised actor in a bar and there is a mutual exposure. But the actor does himself in, is taken, and the young man gets the part. 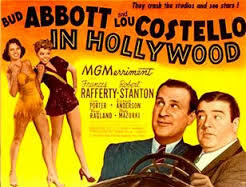 In the meantime, Bud Abbott is trying to control Costello whenever the plot needs it. A typical comedy of the comedians (perhaps anticipating some of the antics of Martin and Lewis, as the straight man and Lewis with his awkwardness and pratfalls).